Friday’s field trip was a fun and exciting one to Science World! We were tasked with choosing an exhibit and discussing its various elements. 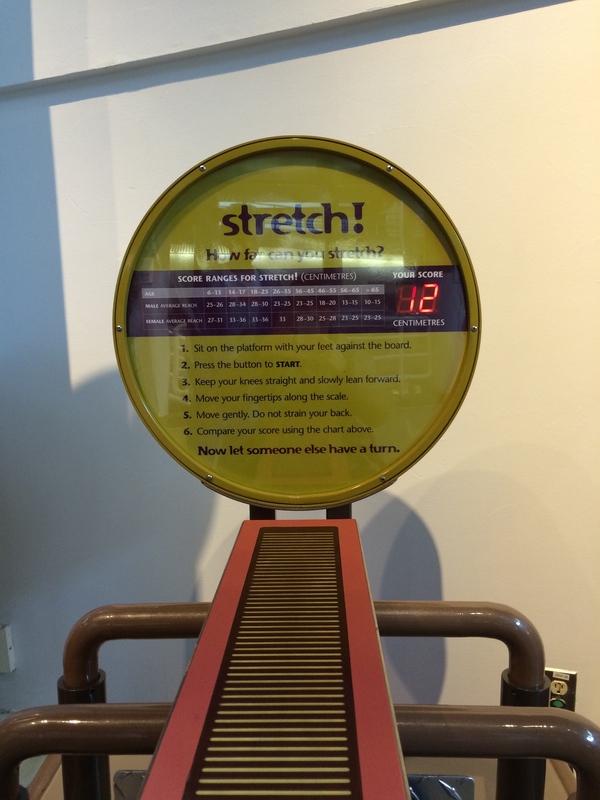 This exhibit targets users three years old and up. It’s really for all users because everyone can find out how flexible they are. 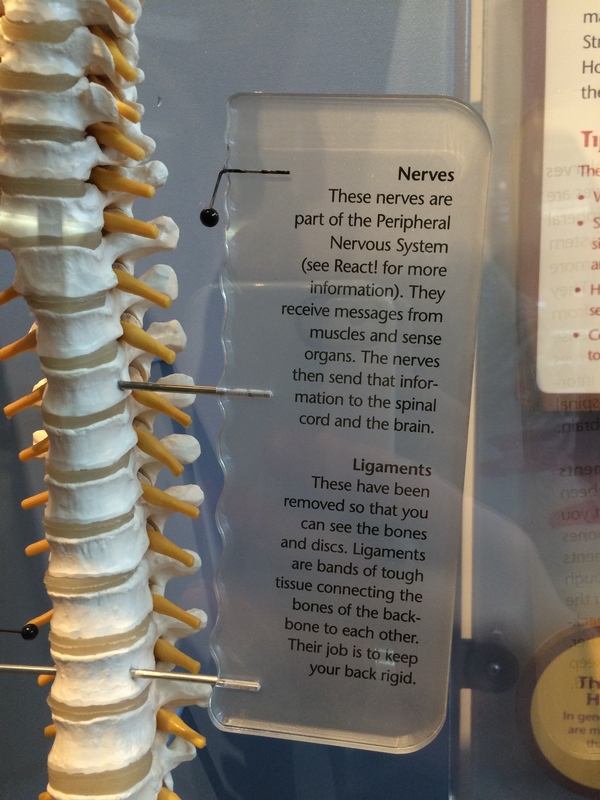 This particular exhibit is in the “Body Works” area and the theme is of how the body functions and in what ways. 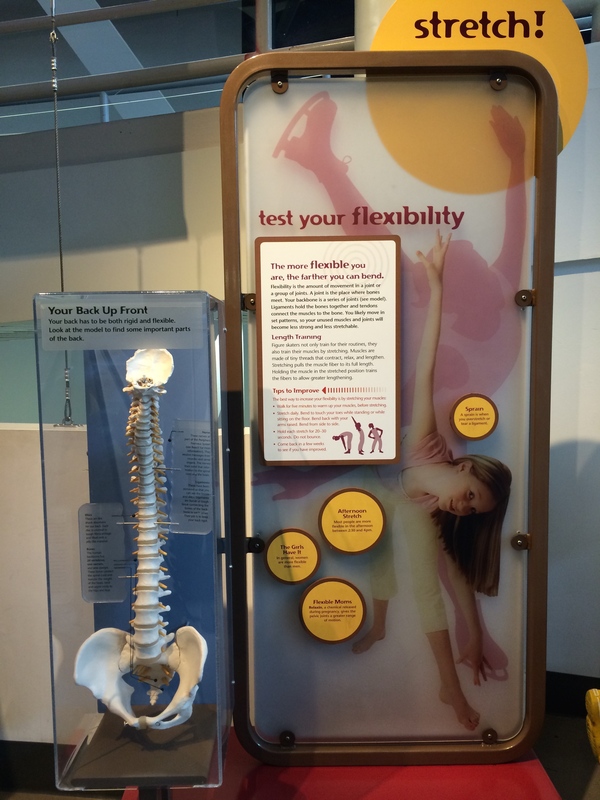 The exhibit allows the user to test their flexibility. The scale is for tall and short users, young and old. The scale is full sized and matches the exhibits around it. The display uses many different materials: plastic, metal, wood, glass, electronics and a sensor pad. The technical construction of this exhibit is rather simple. 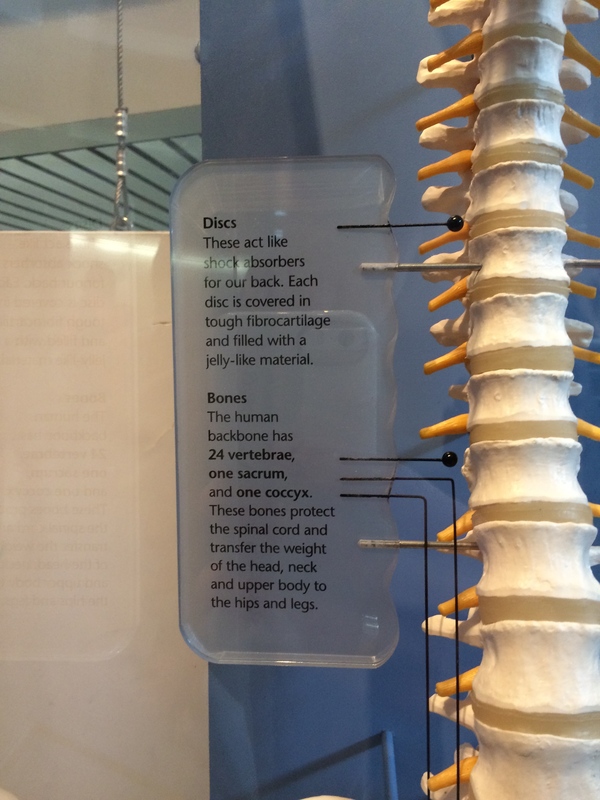 There are no moving parts, compared to many of the surrounding exhibits. The electronics are sensitive to the touch, which translate a reading that is displayed on a screen and shows how flexible the user is in centimeters. This display works to encourage user engagement because there is material to read followed by a test and results, which you can compare with your friends and/or family. Children run up and hop on the sitting platform because there are footprints to indicate how you should sit. The kids push the “clear” button repeatedly expecting something to light up or move. They do not know how to use the exhibit until their parents wander over. Once there, the parents are much more engaged about testing their flexibility and they laugh with their fellow parents at their lack of flexibility. Children tend to test higher because of their shorter heights and also cheat by doing the test incorrectly. If the guardian hasn’t read the instructions properly, then the younger ones do not execute the test correctly. The content is somewhat wordy and the size of the letters is modest and plain. Teenaged and old users would take the time to read the material, if interested. 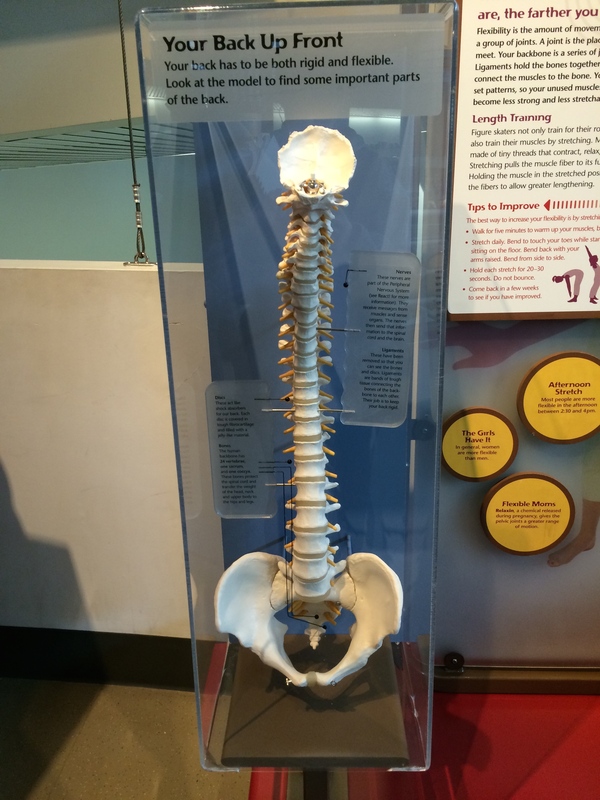 The content displayed is relevant and interesting, and has a very clear connection to the “Body Works” area. The exhibit is mostly successful; individuals enjoy doing the test, but do not read the instructions properly. Their results are then skewed. One person will repeat the test multiple times before allowing another user to try it out. 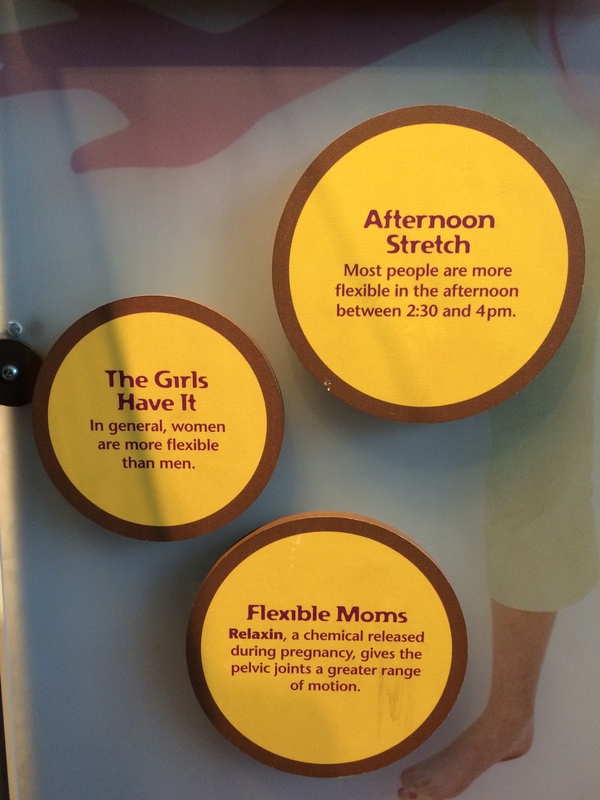 This exhibit requires an adult’s assistance. Each user is at the display for less than 60 seconds, and there was never a line-up while I observed the exhibit. 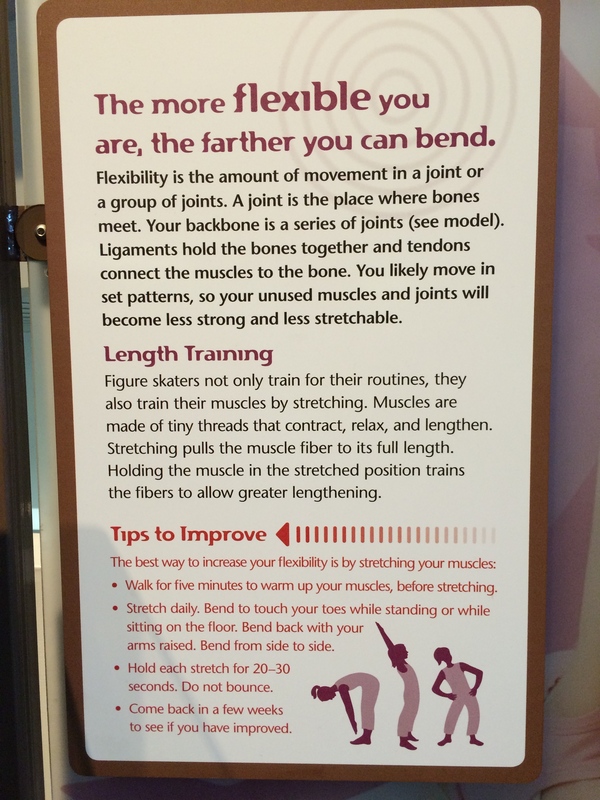 On a side note, I am less flexible than a 56-65 year old male user… Time to pull out the yoga mat! !